For a very long time I worked in the airline industry on both long and short haul flights. I was born in England but I met my english-born husband in Paris and sharing a love of travel, we hopped around Europe. Finally, with a beautiful teenage daughter and our pet cocker-spaniel, we are happily settled in Switzerland and love the relaxed, simple life we live here. Made To Marry was created out of my desire to start a home-based business, so I could still be a stay-at-home mom. I heard about Etsy through a friend who loved crafting and I set about thinking what I could do that I love. Et voilà! 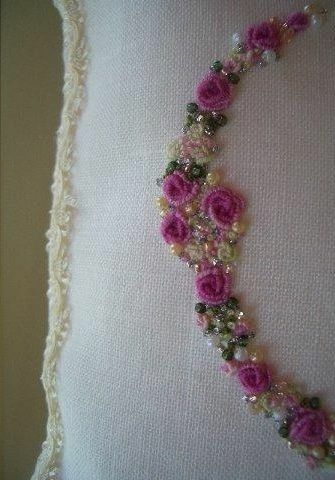 My hand embroidered wedding accessory business was born. I am completely self-taught and my interest in hand embroidery started when I was a child with a love of embroidery kits using different stitch methods and colors to create beautiful pictures for my room. The handmade wedding market and the interest shown in unique wedding gifts spawned my idea to create ring pillows, unique wedding accessories and gifts. I am gradually introducing new products and of course, always thinking of new designs for my pillows. I spend a lot of time deciding on my theme and color of my threads, the ribbons, the type of glass embellishments ( pearls, diamante or beautiful beads) and the shade of material to create a beautiful wedding item that someone will love and have as a beautiful reminder of their special day. All my products are excellent quality and I enjoy sourcing for new materials which will keep my creations special. Here are some of the brands I use DMC, Ver au Soie, Gloriana, , Guttermann and Mill Hill glass beads and Zweigart linens in various shades. All my fabrics are from Japanese,french, swiss ,italian and german manufacturers and are very pretty. I want to offer you, my customer, something unique to have as an everlasting keepsake of your special day whether it be a gift for you or for someone special. If you would like your chosen item personalized, please do message me; I will be really happy to help. So come on in and enjoy my shop.